Pittsburgh is one of those big, unforgettable cities that is packed full of history, culture and arts. Unlike some of the other cities in Pennsylvania, the Steel City offers its own unique vibe and flavor. In my honest opinion, it's one of the best cities to visit in the entire state! 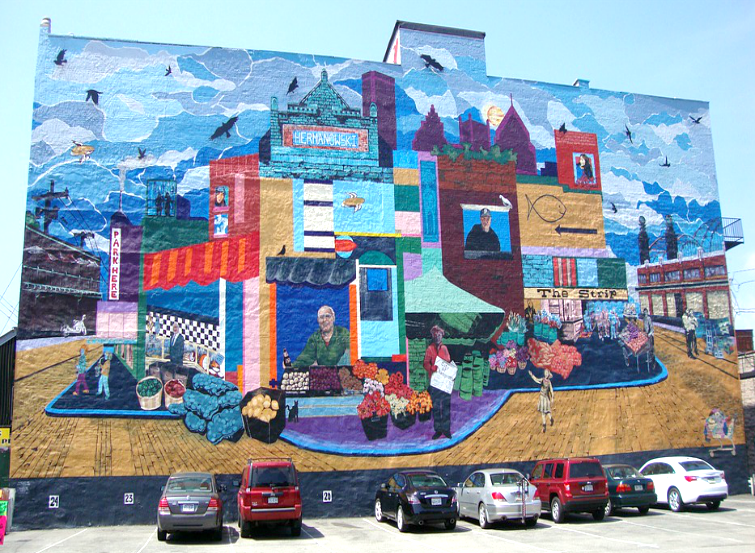 We're big fans of outdoor street art and wall murals and while on a recent trip to downtown Pittsburgh we stumbled upon "The Strip" wall mural that's located at 1907 Penn Avenue in the Strip District. If you've never visited this district...it's a fun place to do some shopping! The wall mural was a collaboration between artists Carley Parrish and Shannon Pultz. It was completed in October 2010 and was officially dedicated in November of that same year. The sponsor for this particular piece of art was The Sprout Fun. It's painted on the side of the Hermanowski Building and is quite large in size. Not only is it a big one, but it's quite colorful too! One of the things that I really liked about it is the fact that it's 3-dimensional. If you look closely...you'll see metal birds that are flying around in the sky. I love how the artists added this 3-dimensional aspect. Pretty cool. If you're looking to photograph it...I recommend going early in the day before the parking lot gets too busy. You'll have to stand in the parking lot about 50 yards away from the wall mural to capture the entire thing in one photo. As you can see...this mural is definitely a must-see if you're going to be in the Strip District while visiting Pittsburgh.